2013 has been a great year. Meyer Law officially launched our new office in Denver this fall and we’re busy helping our clients and community grow. We’re looking forward to an exciting 2014! Our founder and managing attorney, Tricia Meyer, was interviewed for Chicago Tribune’s new Blue Sky Innovation site, where she talked about how startups can avoid legal obstacles. For the startup blog Nibletz, she contributed 5 Legal Steps Founders Should Take Right Now. 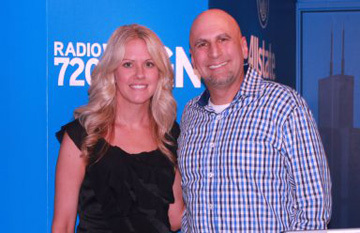 Tricia Meyer was on WGN radio talking to Dave Plier about her experience as a woman and an entrepreneur in Chicago. She talked about the thriving tech scene in Chicago and noted some great resources for women entrepreneurs and entrepreneurs in general. Listen to her interview online. Bootstrapping in America is a web series covering the entrepreneurial world. Our founder, Tricia Meyer sat down for an extended interview in which she talked entrepreneurship, her approach to legal practice and Chicago’s tech scene. Watch her interview here. Click here for a complete list of Meyer Law’s press. Have a legal question? Meyer Law has a column on Entrepreneurs Unpluggd, where we answer one entrepreneur’s legal question each month. Check it out and email your questions to Questions@MeetMeyerLaw.com. What Should I Consider From A Legal Perspective Before Seeking Investment? When Do You Need A Founder’s Agreement? What Legal Entity Should You Choose? In more great news, Meyer Law’s client, The Founding Moms, was named one of the Top 10 Websites for Woman Entrepreneurs and one of the Top 100 Websites for Women, both by Forbes. NaviGo Health‘s web-based tool, CompassMD™, assesses patient-doctor fit to help people find and choose the right doctor. Read more in MedCity News. Our client, CareTree has officially launched. CareTree is a ‘HIPAA compliant Facebook’ where you can create a patient profile and then share access to the profile with doctors, caregivers, or family. Users can centrally store and share care notes, medications, calendar, contacts, medical documents, and other health information. To learn more visit, CareTree’s website. Have news you’d like us to share? Send it to Info@MeetMeyerLaw.com for inclusion in an upcoming newsletter. Visit our website’s Events Page to stay up-to-date on Meyer Law’s latest events. We love our new website. Head over to MeetMeyerLaw.com and let us know what you think!